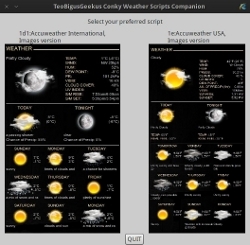 Some scripts for displaying a weather forecast on your conky. They use Accuweather, Weather Underground, National Weather Service (USA) and Weather.com. They all rely on the same principle: download a bunch of pages, parse them and isolate the necessary info for conky to find. There is something for everyone: from the minimalistic (1c), to the humongous, larger than life, "I'm a meteorologist" aspect (4). Check out Conky Companion as well: a graphical app which can help you create your own conkyrc files easily. If you find the script too heavy or too long, here's a version of it providing only half the info and using half the space. Awesome suggestion by Sector11: see here. Greek, French, Spanish, Hungarian and Portuguese versions included. Check out Sector11's hybrid conkyrc displaying 2 international cities and 2 US ones: click. 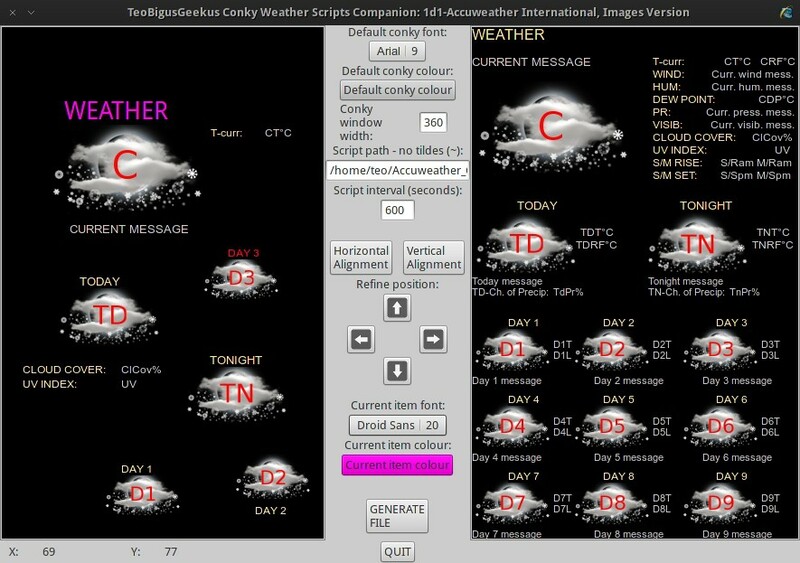 A graphical app (gtk+2.0) to help you create your own customised conkyrc from the info downloaded by the scripts. It's not perfectly accurate, but it could save you some time when creating a complicated conkyrc. 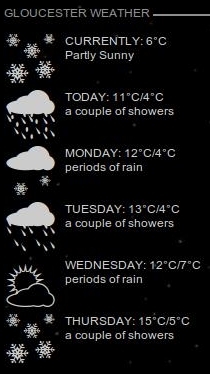 Is weather.com free again? They began to charge 19.90$ per month some time ago, I think. 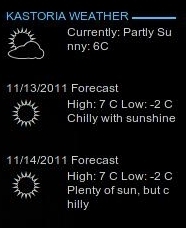 You're referring to kaivalagi's script; mine takes info directly from the centre page of weather.com. Either that or they decide to change something about their site design. 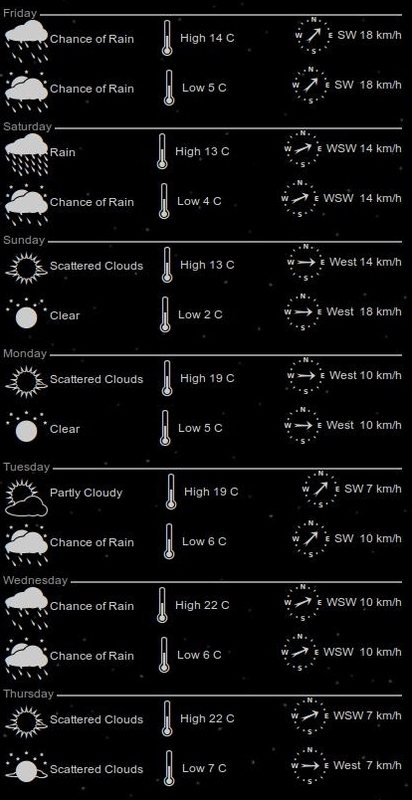 Just tested the 1d2 script, accuweather with font , and it seems very nice! Have to do some tinkering with layout though, to adjust it to my 32" TV and fontsizes around 24 pixels. But that's just fun! Also, I will try and set the timings for downloads and stuff. By the way, celsius and metrics worked rigth out of the box! Not too common for weather scripts. Multiple cities, what a concept! draw_shades no #### <<<<<<------------------To see it easier on light screens. ## Above and After TEXT - requires a composite manager or blinks. # The all important - How often conky refreshes. # If you have a "Crey" try: 0.2 - smokin' - but watch the CPU useage go UP! EDIT Decided since I was here on the blue side I'd use the proper colours! Yea, "wget" doesn't care if you've signed up or not. See post below this one. For as large as it is I'm not using all the information that the scripts can get. Pretty powerful ... and free too! Spacing was a nightmare. Had to "hardcode" some results to get actual widths from a lot of commands. if we get to 101°C we're in HOT trouble but 101°F is a consideration and lets hope we NEVER see -101 either in F or C we're all popsicles. Moon phases are reduced in size to allow Waning Crescent or Waning Gibbous, longer than Full or New to fit. 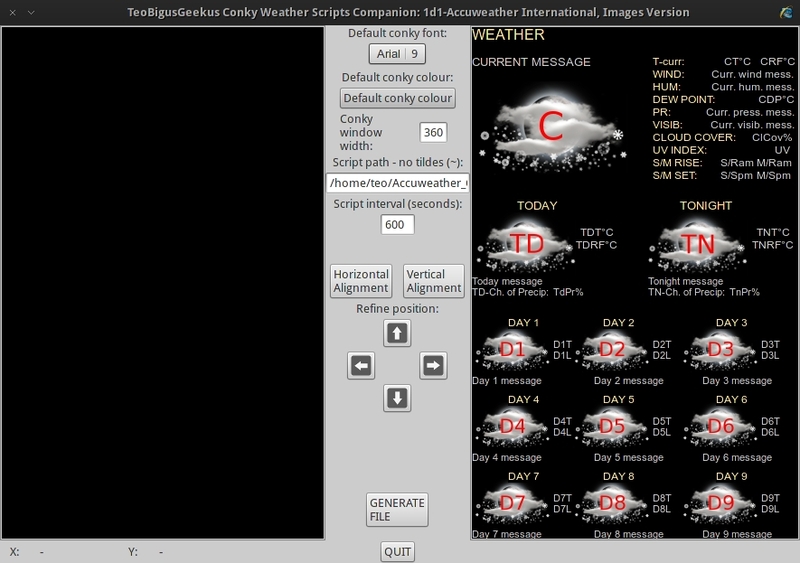 Interesting, as will all weather scripts, you can grab as much or as little info as you want. 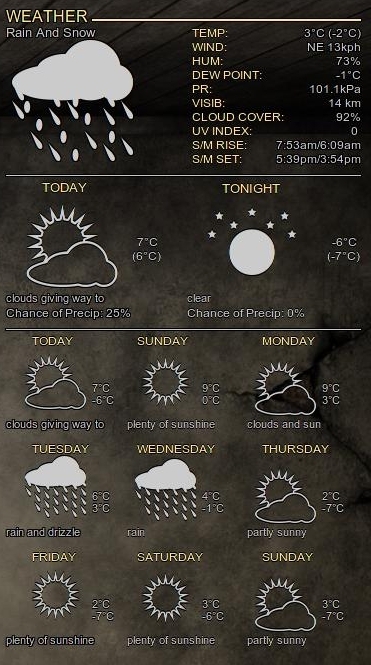 I'm back, this time with a full conky using Accuweather RSS - All users mind you it's configured for here & metric. I call it: Hugs are hugs, and out of 3, this is a 5 Star HUG if I ever saw one! ~/lowph/lowph.conky <<-- this starts it! ~/lowph/images <<--- has some extra as well! Sorry for what seems like a flood of posts, but if Teo is moving his weather thread here from the "Orange Side" and supporting it here, I'm bringing my support for his work here as well. He has put a LOT of work into these scripts and they deserve to be seen, and appreciated. So if you create a different layout, as part of a full conky or just a different weather layout, show it off. It might help others having problems. Me - I know nothing about bash scripts, but I do know a good thing when I see it and I play with layouts. Using the latest revision as of: 1 Apr 2012 - Thanks Teo. WenQuanYi project was started by Qianqian Fang (Screen name: FangQ; Chinese: 房骞骞), a Chinese biomedical imaging researcher at the Massachusetts General Hospital, in October, 2004. Now the fonts of WenQuanYi project are included with of Ubuntu, Fedora, Slackware, Magic Linux and CDLinux. Debian, Gentoo, Mandriva, ArchLinux and Frugalware offer the sources for WenQuanYi fonts. The fonts are among the Chinese fonts officially supported by Wikimedia. WenQuanYi's website is using Habitat, a Wiki software derived from UseModWiki by Qianqian Fang. It is allowed to create or modify the glyphs online. Dumbledor 1 Cut Up is used for "Now temp" and "FL temp" if FL is equal to or higher than the "Now temp" and if higher it will also turn red. Dumbledor 1 Cut Down is used for FL temp when it is cooler than the Now Temp and it will be blue. Other than that everything is out of the box with some 'slight' changes in the directory structure and calling of the same. will also need to be edited according to Teo's instructions and make sure you get the sub-directory so the files created stay with the proper city. Welcome home brother; thanks again for your kind words and support (for the millionth time). I've added references to your posts at the first one. Is there a way to link to a post in this forum? And wouldn't you know it, there's someone adjusting a rain cloud already! before the last kill command. Replace the /home/teo/, etc with the script's path. EDIT: Oh yea, that same guy fixed the FRIDAYDAY & MONDAYDAY booboo seen in the screenshot!! Hey Teo ... Good to be here. Yea click on Today: blah blah or the date to the top left of a post. Oh yea, seem like my signature changes pointers too! I wonder how that happened? Thanks a lot man, I'll update the post immediately. EDIT: All done, thanks again. More than welcome Teo, this place even feels better! Hi, your weather conkys look great and the minimal one (1c) looks as if I could squeeze it into the bottom of my modified conky orange (thanks to GNOME-LOOK user hardball), which I've "Minted". I'm sure I'm missing something basic! 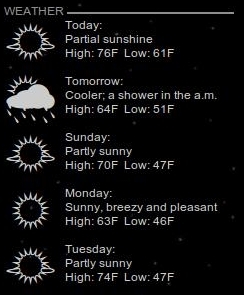 my $/home/kathy/Accuweather_RSS/weather exists but is still blank. I would post a screen shot but I don't know how to do it - I'll find that out - meanwhile, any clues? 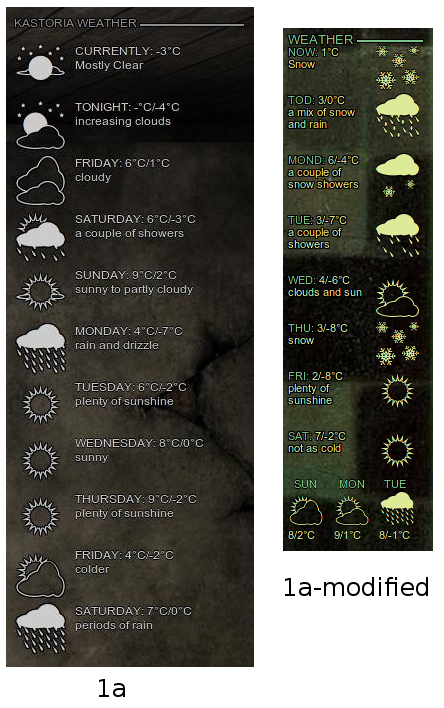 I'm pretty sure I haven't inadvertently changed anything yet conky only writes KASTORIA WEATHER _______________. I also doubled my text_buffer_size to 4096 just in case. Reason for edit: poor grammar! If anyone needs any extra info ... please ask! Moderator edit: Linked pictures exceed our size policy. Converted image tags to url tags. Reason for edit: changed images to thumbnails. I feel bad, and very red faced. I was sure I had it, but Teo's is right, it will not work. I got it to work in my local website, but that doesn't help - it's not an RSS feed. There has to be a place closer to you than London that you can use. Wicked, Gloucester isn't some small out of the way village it really 'should' work. Maybe weather·com, that should work. EDIT: It does, but it hauls down a LOT more info than you want. Thanks for the suggestions, I will try them later and let you know how I get on. Thanks Teo and Sector11 - works a treat!